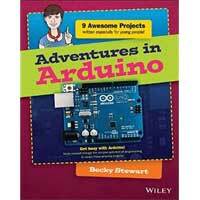 Adventures in Arduino is the beginner's guide to Arduino programming, designed specifically for 11-to 15-year olds who want to learn about Arduino, but don't know where to begin. Starting with the most basic concepts, this book coaches you through nine great projects that gradually build your skills as you experiment with electronics. The easy-to-follow design and clear, plain-English instructions make this book the ideal guide for the absolute beginner, geared toward those with no computing experience. Each chapter includes a video illuminating the material, giving you plenty of support on your journey to electronics programming.